Grouper is known as one of the best eating fish in the ocean! It’s that time of year we’ve been waiting for when you can catch and keep several different species of Atlantic grouper in the Florida waters. The season runs from May 1st through December 31st. These Atlantic species are closed annually during their spawning season from January 1st through April 30th in order to ensure long-term sustainability of the species. 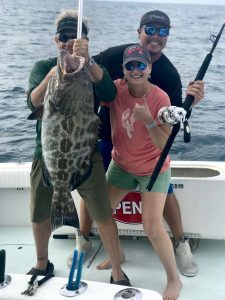 Recreational anglers may take up to three groupers per person per day. Within this limit, each person can have only one gag or black grouper, but not both. The best part about the opening of grouper season…. they are biting and they are so good to eat! Book your fishing trip with Captain Dennis on the Free Spool so that you can be planning a delicious grouper dinner!